For 35mm cameras, see the Category: 35mm film. The 35mm format for film was first developed on an experimental scale in Thomas A. Edison's laboratory more than 120 years ago. Edison's associate William Dickson created devices for photographing and viewing moving images on film loops 35mm wide, for which Edison filed a patent in 1891. This width originated by slitting 2.75" wide film rolls in half, and adding perforations. These rolls were supplied by the Eastman Dry Plate and film Company in Rochester, NY; however, it took several years for 35mm movie film to become a regular Kodak product. Once cine film became widely available, it did not take long for inventors to imagine 35mm still-picture cameras which might be more easily portable than the common large-format plate cameras of the time. Although the first design was patented as early as 1908, it is generally accepted that the first commercially available 35mm camera was the 1913 Tourist Multiple, made by the New Ideas Mfg. Co. of New York. This camera ran the film vertically and exposed the standard 18x24 cine frame size (equaling four sprocket holes per frame). 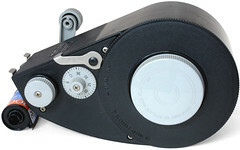 This was soon followed by the Simplex, from New York's Multi-Speed Shutter Co.. 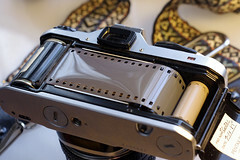 The camera permitted a choice of either the cine frame size or the "double" frame 24 x 36mm format. However the camera which brought the 24 x 36mm image format into much greater prominence was the Leica. Oskar Barnack built his prototype Ur-Leica in 1913-14 and had it patented. His employer Ernst Leitz always promised to bring it to the market but only launched a 25 pieces pre-production series in 1923, maybe as answer on the earliest true concurrent camera model Le Furet, introduced in France in 1923, and began series production with the Leica A in 1925, with the start of Germany's first interwar prosperity period (1925-1929 under democratic regime, the second was 1936-39 under dictatorial regime). The Leica was followed by the Zeiss Contax in 1932, as well as by less expensive cameras such as the Argus A which brought 35mm shooting to a larger market that could not afford the top-quality German models. The earliest 35mm cameras used cine film bought in bulk and loaded into the cameras in the dark room; but Leitz introduced a film cassette which could be loaded with 1.6 meters of film in the darkroom, which then could be loaded into the camera in daylight when required. Several photographic suppliers made such daylight cassettes for the user to load from bulk. By the early 1930s film manufacturers also supplied film in disposable cassettes, and in 1934 Kodak created an industry standard by introducing the now-ubiquitous 135 format disposable cartridge along with their Retina cameras. Today's 135 cassettes typically have enough film for 12, 24 or 36 frames (of standard 24 x 36mm size). 18 exposure rolls used to be available and sold as a half-length roll. It was replaced by 20-exposure rolls which were once common. Disposable one time use cameras typically advertised as having 27 exposures, the length is the same as typical 24 exposure rolls, but there is less waste since the film is pre-loaded in a darkroom. The 135 format became by far the most widely used photographic medium until the emergence of the digital camera. There were other, rival daylight-loading systems, but most of these were minority formats compared to 135. One successful was the Agfa Karat system, which was introduced for the Agfa Karat cameras in 1936, and was produced until 1963. In 1964 Agfa revived the Karat 35mm cartridge system, called it Rapid, trying to compete with 135 film's mightiest rival, the type 126 Kodapak cartridges, the popular 35mm cassette film system, which boosted the market for beginners' cameras for nearly 2 decades but could not compete with the image quality delivered by common 35mm cameras. 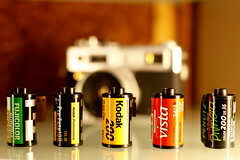 Compact cameras for type 135 film regained market shares for the traditional 35mm film. Especially their motor-driven easy-load-mechanism for the old 35mm film cartridge made the cassette film's only advantage superfluous. The most recent, and likely last, rival to 135 was APS - which perhaps would have gained wider adoption, but didn't because of the beginning digital era, and when APS was introduced the market was already quite saturated with fully automatic compact cameras for 35mm film. Thus the cartridged 35mm film could celebrate in 2013 its 90th birthdday as the most popular film system in camera history, as its winner. But the digital age has busted film's market shares at all. Bulk backs are available for some cameras, aimed at professional use, which allow the photographer to use 100-foot lengths of film at a time, minimizing the inconvenience of having to reload the camera and miss a shot. These were used by some sports photographers, but the digital revolution has largely made bulk backs obsolete. The frugal photographer can still buy 35mm film in 100-foot lengths and spool his own cassettes. This involves putting the roll of film into a bulk loader in complete darkness. Reloadable cassettes are then filled with film using a crank on the loader. The film is then cut and a leader cut into the tail of the loaded cassette. All this can be done in daylight, hence the loaders are called "daylight loaders". In contrast to the plate and roll-film cameras of the early 20th century, 35mm was regarded as a "miniature format." The term is often seen in advertising and other photographic writings from the era (such as the US magazine title Minicam), but was also used for cameras that shot the smaller frame formats onto type No. 127 film, for example the Falcon Miniature. As the quality of film stocks improved, there was a growing acceptance of 35mm for professional work; so by the 1960s the term "miniature" had essentially fallen out of use. Miniature is good as historical term to distinguish this class of cameras from subminiature and medium format cameras. A digital image sensor with the frame size 24×36mm of the standard 35mm film format is called a "full format". sensor. So just 90 years after the Leica 0 pre-series its format celebrates a Renaissance since it's digitally no more limited to some digital SLRs but also available in digital compact cameras, digital mirrorless system cameras, and even in the newest digital Leica rangefinder cameras. This page was last edited on 22 December 2013, at 18:01.